Here at Seafarer we having been running flotillas in the beautiful Dalmatian Islands for well over a decade now, and we have, in our opinion, the knowledge and experience to take you to the best spots that this part of the Adriatic offers. Either of our flotilla routes starts from our exclusive base – which is located in the sheltered approaches to the Krka River and is ideally and centrally located to explore the best of the Dalmatian Coast. Unlike a busy marina, our base is quiet, with most yachts looking out across the river – this provides a peaceful and quite private start to your holiday. A 10 minute stroll along the river leads to the small village of Zaton, which has all the amenities you need for the first and last night of your trip, with a supermarket, outdoor market, several restaurants and bars and a couple of boutiques selling local delicacies and souvenirs. One of our favourite restaurants is located in Zaton, and we make use of their hospitality on the last night of the flotilla with a farewell meal, showcasing the local speciality, Peka, which is cooked under the hot coals in an outdoor fire. 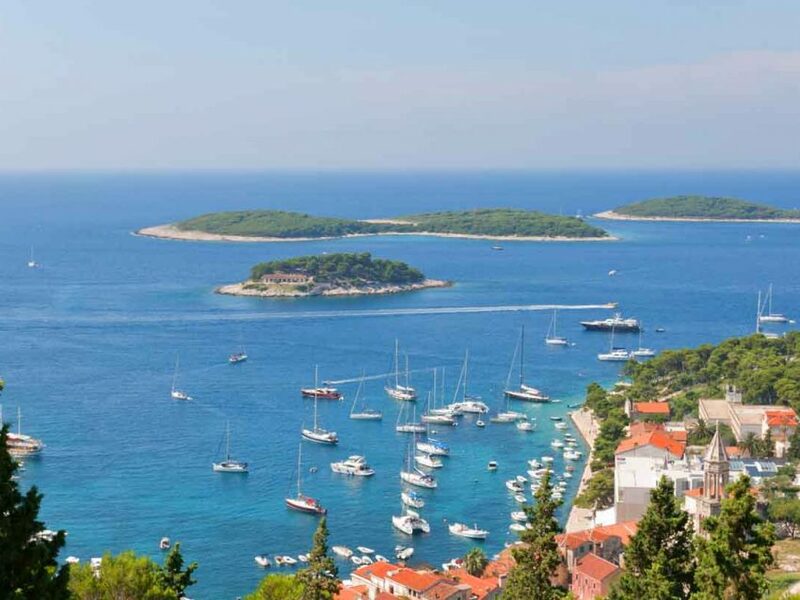 Once the experienced local team have finished the briefings, its time to head out sailing, and depending upon the week, heading either north to the Kornati national park, or South towards Trogir and Split. 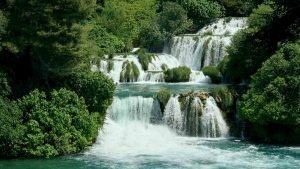 One or other of the routes may appeal particularly if you are looking for either culture and history or alternatively national parks and the unspoilt Croatia, although of course the perfect choice would be to combine both routes in a two week holiday to experience the best of both. Our route heading north focuses on the Kornati National Park, often referred to as a “nautical paradise”. The park comprises 89 islands, islets and reefs and provides some excellent sailing and some beautiful spots from which to swim, relax and enjoy the unspoilt surroundings. Weather permitting, we avoid marinas entirely on this route, with a mixture of town quays and restaurant quays – very different from the regular image of busy marinas that pepper the coast and islands. We ease into the week in Zlarin, an island without cars giving a peaceful first night away from our base. 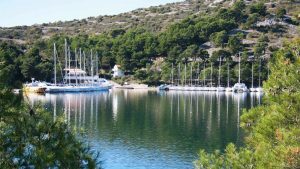 Other stops on the route include Zminjak, a beautiful bay with a single restaurant – mooring is free, and the restaurant is excellent, with the bay providing the opportunity to enjoy an evening or morning swim in pristine waters. Later in the week we enter the national park, and moor in Smokvica, a beautiful little secluded bay on this islet. Our regular program finishes with a free sail, with plenty of options, from staying in the National Park to exploring further up river from our base to Skradin, and the iconic Krka waterfalls and national park. From the rustic unspoilt charm of the Kornati route, our southern stops showcases the cultural and historic side of this beautiful coastline. 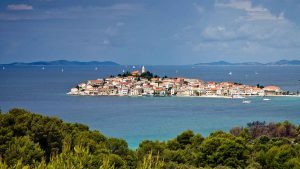 The first of our favourites is Primosten, a small town dating back to the 16th century, originally strategically situated on an island – connected to the mainland by a moveable bridge that has since been replaced with an embankment, turning it into a peninsula. The walled old town is stunning, and the views from the church at the top of the hill are well worth the climb through the cobbled streets. Rogoznica is another favourite, and the town quay showcases the typical waterfront feel of many towns along the coast. 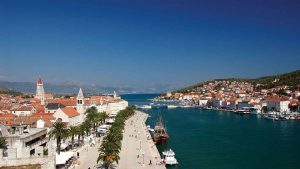 Trogir is perhaps the biggest draw, and this UNESCO protected world heritage site has often been described as a “mini Dubrovnik” with a maze of cobbled streets, full of bars and restaurants, enclosed within the imposing city walls. The winds in the area can be challenging at times, but the protected nature of the waters means that sailing is virtually guaranteed. The temperatures are idyllic during the summer months, with August high in the mid-thirties, although the breezes tend to keep the temperature manageable. Our experienced flotilla crew and local team know the area very well and ensure that any changes to the route are measured to keep everyone safe and enjoying the best that the Adriatic has to offer. There are plenty of flights from the UK, from regional airports as well as the usual international hubs, we can arrange the whole package for you, including your flights and transfers. Benefit from Atol protection when booking your package with us and look forward to a relaxing and care-free flotilla holiday with us on the Dalamtian coast.